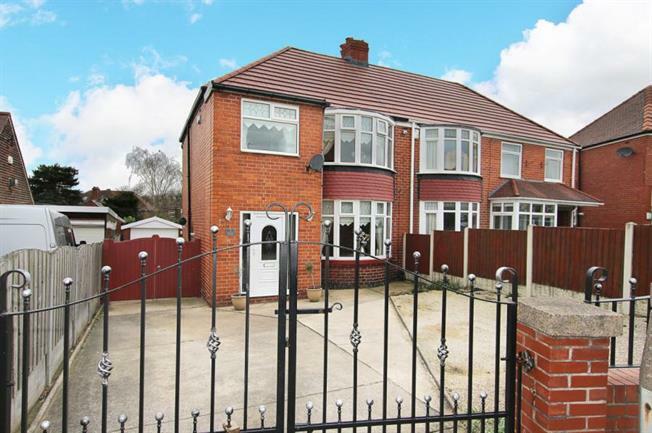 Viewing this EXTENDED semi-detached family home is a must to avoid disappointment. This property would suit a varied purchaser with its popular location that gives access to local amenities, public transport links and the M1 motorway network. Only by taking a detailed internal inspection can this extended, three bedroom semi-detached home be fully appreciated. In brief, the property comprises of an extended entrance hall with stairs to first floor landing and a bay windowed lounge with feature fire surround. The extended breakfast kitchen has a central island and a range of fitted wall and base units including integrated appliances. The kitchen leads off to a sunroom with doors leading to the rear garden. The first floor landing has three bedrooms, the third being extended and the family bathroom contains a white three piece suite. Outside there is a drive and garage with a pebbled area to the front, decorative walls and gates at the end of the driveway. To the rear is a well-proportioned garden with a decked area, a larger than average lawn surrounded by mature trees and borders.